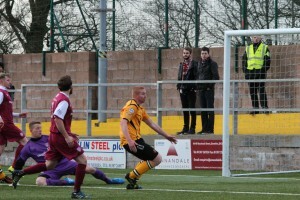 Annan Athletic recorded an important victory over top of the table Arbroath on Saturday. It was the second victory over a top three team in successive weeks and was a game which very much resembled the previous weeks action with the Annan fans being put through the wringer in the first half with Annan having to defend resolutely to contain the fast moving Arbroath team who were in complete command territorially and but they lacked the cutting edge up against a well organised Annan defence who once again recorded a clean sheet. Annan’s starting eleven saw Jordan Hart getting the thumbs ahead of the consistent Alex Mitchell otherwise it was the same starting eleven who ground out the result against Queens Park the previous week. From the kick off it was Arbroath who made their intents known with Annan keeper Jordan Hart being called into action to deal with Paul McManus’s 5th minute strike. Thomas Grant squandered a good opportunity in the 10th minute when he blasted over the bar after a good patient build up from the Lichties who were very much taking the game to Annan with Bobby Linnn looking in menacing form down the right. Annan’s first real attack in the 17th minute was well constructed with McColm’s prodding run down the left, finishing with a low dangerous cross which was well defended for a corner with Steven Swinglehurst managing to get a header on target from Mitchell’s corner kick. 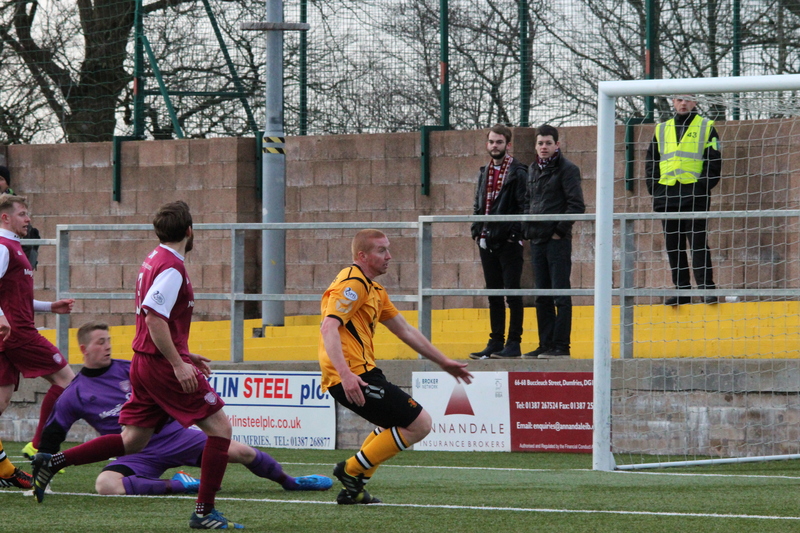 Minutes later Flynn sent in a low shot from 25 yards which keeper Marc McCallum smothered to avert the danger. Linn looked in menacing form and as the game approached the 20 minute mark he finished a fine penetrating run with an inviting low cross which Black did well to clear. Annan had a real escape minutes later when Jordan London cut the ball back into the path of Thomas Grant who once again failed to hit the target. It was a good period for the visitors and it continued with Linn hitting the side netting. Arbroath were pulling the strings and Annan’s fortunes did not look good when Flynn had to leave the field after a block challenge to be replaced by Steven Logan. Arbroath were fortunate in the 38th minute when Andy Mitchell’s corner kick was headed narrowly past the post by central defender Ryan McGeever. Arbroath squandered a good scoring chance as the match approached half time when Logan brought down Lynn who was stopped in his tracks following a surging run but Hunters free kick from 25 yards was shocking when his effort was blasted miles over the bar. Jordan Hart who had not seriously been tested in the first half pulled off a good save low down to deny Paul McManus at the start of the second half. Peter Weatherson then tried his luck with a 25 yard effort which keeper McCallum was glad to see land on the top of the net. Annan opened the scoring in the 59th minute with a goal which Arbroath will feel they could have avoided. Andrew Mitchell’s free kick from wide on the right appeared to go past several players before Steven Swinglehurst got the all important touch to guide the ball into the net from 6 yards. This goal was followed by a good effort from McClolm from a promising position. Weatherson won a free kick in the 63rd minute and once again Mitchell’s free kick caused alarm in the Arbroath defence with Swinglehurst’s header going narrowly over the bar. Arbroath introduced Murray and Buchan in an effort to halt Annan’s increasing grip on the game. Simon Murray was only on the pitch for a few minutes when his well directed header hit the base of the post. Annan keeper Jordan Hart was rarely troubled but he dealt confidently with a contentious free kick in the 72nd minute awarded against Swinglehurst by plucking the ball out of the air. Arbroath were unfortunate following a goalmouth scramble in the 74th minute when Steven Logan cleared off the goal line and at the other end Swinglehurst was once again unlucky when his header from a Mitchell corner went narrowly over the bar. As the match entered the final 10 minutes Arbroath pushed forward but without posing any real threat on Annan keeper Hart. Annan sealed the match in injury time with a superb counter attack goal. Arbroath were pushing forward when Annan broke from defence with the ball played forward to Josh Todd who did well to pick out Peter Weatherson who finished clinically with a superb curling shot past the reach of the diving Marc MCallum to secure an important victory for Annan which keeps their play off hopes alive. Arbroath like Queens Park and Albion Rovers have worked their way into a strong position to win the league but which one of them will win the league is still very much in the balance with the chasing pack gradually cutting back the points defecit. ANNAN ATHLETIC: Jordan Hart, Kieran Brannan (Iain Chisholm 73 min), Steven Swinglehurst, Martin McNiff, Peter Watson, Steven Black, Andrew Mitchell, Matty Flynn (Steven Logan 37 min),Peter Weatherson, Josh Todd , Stuart McColm (Rabine Omar 91 min) Subs not used Jack Breslin, Chris Dickinson, Ryan McStay, Alex Mitchell GK. ARBROATH : Marc McCallaum, Liam Rowal, Craig Johnstone, Liam Gordon, Ryan McGeaver, Mark Whatley,Bobby Linn, Adam Hunter, Paul McManus, Thomas Grant (Simmon Murray 62 min) ,Jordan London (Kevin Buchan 64 min) . Substitutes Not used Ricky Little, Kieran Stewart, Jack Smith, Johnny Lindsay, Lenny Wilson GK.